How the Beatles' "Yellow Submarine" colored pop culture . Beatles Radio: The Beatles, Solos, Covers, Birthdays, News The Fab 4 and More! Entering the Parisian showroom where Stella McCartney recently presented her new men's collection, there’s no mistaking her inspirations for this season. A large-scale reproduction of the famous Beatles’ yellow submarine, a recurring motif in her latest Pre-Fall collection, dominated the room. 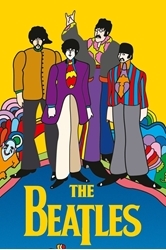 Last summer, the animated film Yellow Submarine celebrated its 50th anniversary with a manually restored version, image by image, while the album of the same name, featuring the soundtrack from the film, was reissued. It had been remixed for the occasion at the well-known Abbey Road studio. For Stella McCartney, it was the message of love and cohesion surrounding the universe of Yellow Submarine, with songs such as All together now or All you need is love, which inspired her, during a screening of the film which she attended with her father. "I think it’s so relevant to now, bringing the world together, the people together, breaking down barriers … [they were]modern, ahead of their time, these four young men,” she explained recently to Vogue.